A name like Colton Cartwright conjures up images of Wild West gunslingers. Maybe Wyatt Earp and Doc Holiday's sidekick. But Cartwright is as far from the ol' dusty trail as he could get—he is a modern day Bahamian fisherman, and he's as passionate about saving his fishery as he is about catching fish. The 25-year-old Bahamian is a pure island boy who has been fishing and diving since the age of six. He hails from a long line of commercial fishermen—ironically a breed whose future may be as tentative as Billy the Kid's. Cartwright is also a team member of a talented group of scientists, divers and explorers who are conducting critical research on the reproductive cycles of Nassau grouper. Because, no matter how much you study fish in the laboratory, there's no substitute for the experience and knowledge of a real, live, local fisherman. As founder of Ocean Crest Alliance (OCA) and one of the organizers of the grouper expeditions, I understand the great importance of working with the commercial fisherman and the community of Long Island. Throughout the expedition, Colton had us all mesmerized with his stories; and while diving, he'd study the tides and then tell us exactly where the fish were going to be. He was spot-on each time. 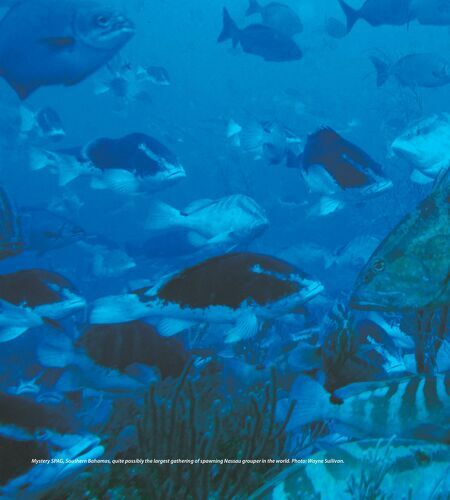 The fish I'm referring to are Nassau grouper, which come to reefs in massive schools—numbering into the thousands—to lay their eggs…kind of a giant BY JOSEPH IERNA, JR. 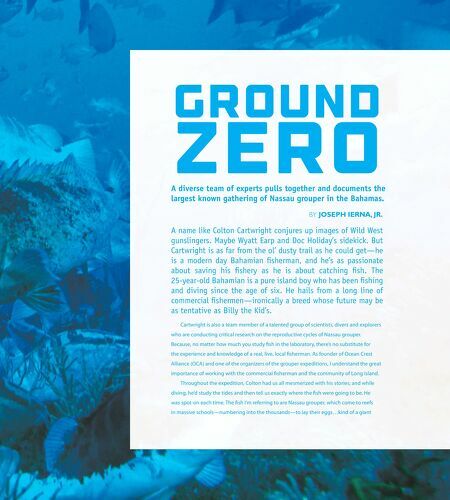 Ground Zero A diverse team of experts pulls together and documents the largest known gathering of Nassau grouper in the Bahamas.